I do like a walk with a purpose, so I revelled in planning the delivery of a newspaper-style publication to an MBA bothy. Uags is perched on the far southern tip of the Applecross peninsula, curled around by the waters of Loch Carron, the sweep of sea along Skye’s shores from Broadford to Loch Sligachan and the Inner Sound of Raasay. Since January my friend Charlotte and I had been planning this trip for the cusp of the spring equinox, imagining the awakening of the year, perhaps even some warmth as we overnighted in the spectacular spot we had pointed to on the map. Our expectations were met by blizzards as we left Perthshire, and even though the sun was by then shining, a tad overshadowed by the notch we drove through snow drifts double my height on the summit of the Bealach na Bà. According to the Met Office, the temperature was due to plummet to minus six that night. Spring, did you say? 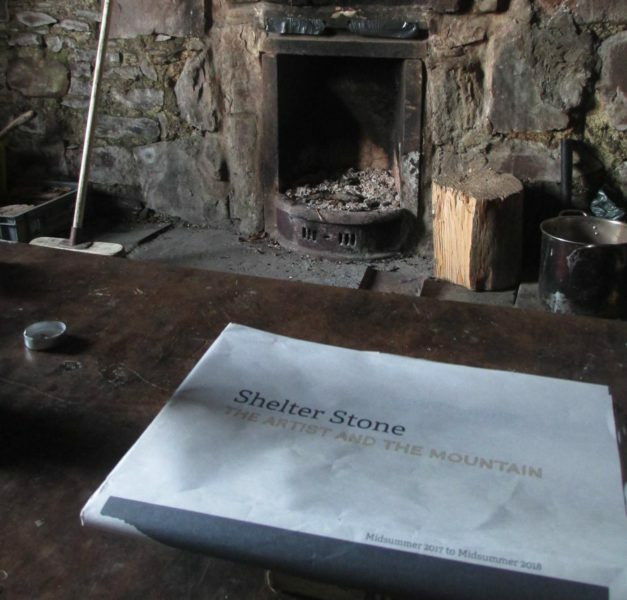 As one of the delivery volunteers charged with getting, between us, a copy to every MBA bothy, it was perhaps ironic that my own contribution to the publication Shelter Stone–The Artist and The Mountain was an account of a storm-enforced and psychologically uncomfortable night spent at the old Camasunary bothy. In general, I would far rather stay in my tent, without the scuttling of rodents, or unsettled by the bizarre assortment of things left by other people, and the uncertainty about who else might turn up. But here we were, setting out to take part in what Ed Summerton, the project’s instigator, has called ‘the toughest paper round in the UK’, with the intention of ‘camping without a tent’, as walkhighlands advises to be the nature of the bothy experience. Various locals we met on our way had barely disguised their intakes of breath when we told them where we were going, but wouldn’t be drawn more than: ‘Boggy, you know,’ or ‘easy to lose the path.’ Departing at lunchtime from the sparkling white cottages of Toscaig through a gaggly collection of domestic geese, ducks and hens, we quickly realised that low temperatures gave us an advantage: Our feet fell firmly on solidly-frosted ground and even when we did lose the path, it was easily recovered. 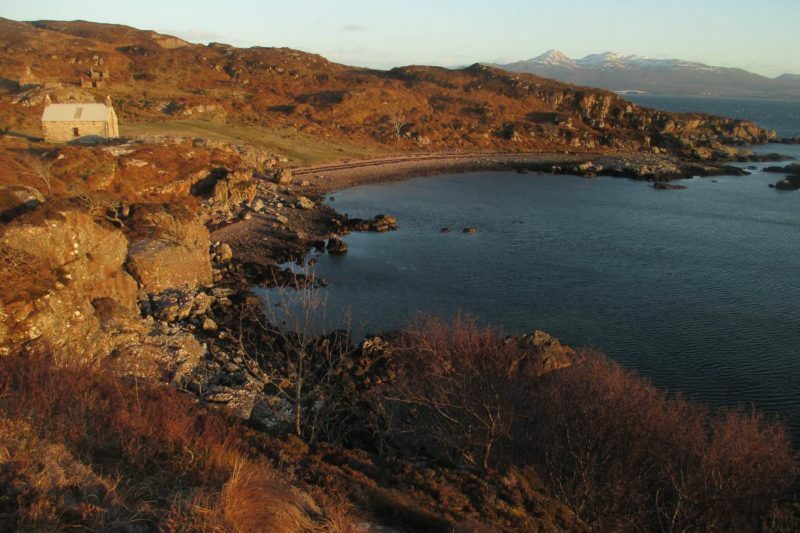 Added to this, a small climb soon spread coastal scenery around as in all its magnificence. 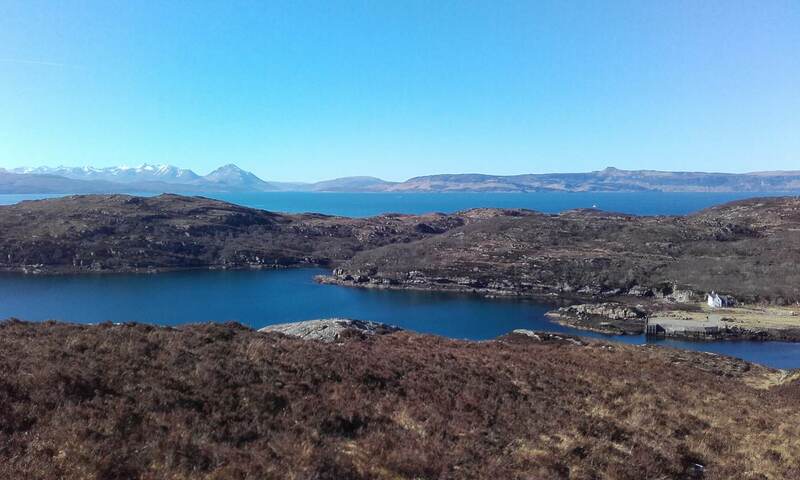 We scanned the horizon to our west, from the unmistakable flat-topped hat of Dun Caan on Raasay southwards to the snow-stroked Cuillin, all seen across a turquoise wind-whisked stretch of water. And as we moved south, climbed a little more, we looked across the mouth of Lochcarron, over to Kyle of Lochalsh to the prickly profile of the Five Sisters of Kintail. Elation rose steadily. Despite packs heavy with things to fortify us against the overnight freeze, we had only a couple of miles to walk, hours of daylight left, and in certain places on the path were completely sheltered from the stiletto-sharp winds, able to bask with Gorgonzola sandwiches and a flask of tea, staring at an impossibly beautiful vista. We were in no hurry, watched a huge black submarine pass through the sound below us. 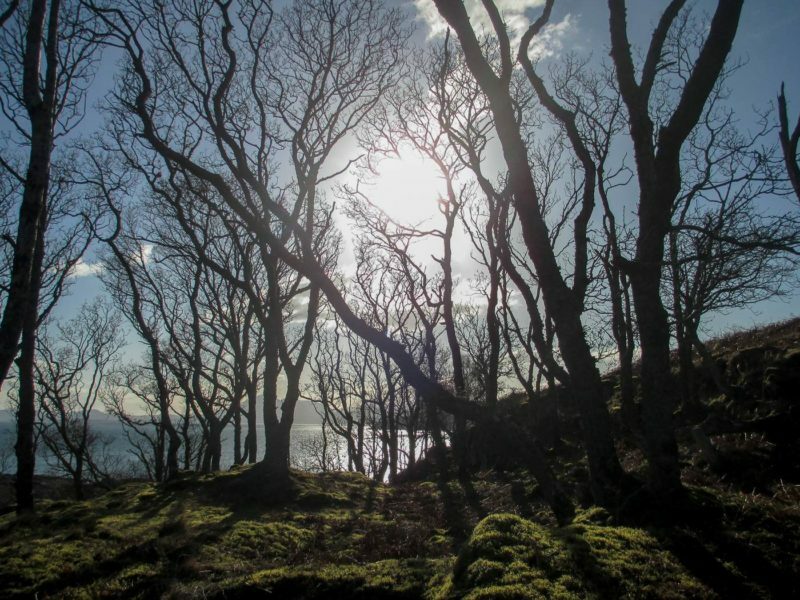 As we moved on, the Crowlin islands appeared just off the mainland shore to the south-west and finally we were dropping on a winding path and through a writhing stand of silvery-barked Atlantic Oakwood, the brilliant moss mattress beneath it undulating with black shadow. And behind it was projected a sheen of sparkling sea and the rise of the mountain skyline. It was at this point, through the trees, that we first glimpsed our home for the night: a robust looking stone cottage standing slightly above a grassy apron that ran down to a small bay. Crag-encircled, and curved around a pebbled beach, this place gave a sense of curious homeliness and shelter. Beyond the apron the remains of the settlement remained, buildings roofless and colonised by opportunistic saplings; the classic signals of Highland depopulation. The sight of our humble home offered made me feel almost tearful. We were so blessed. We spent the rest of the afternoon exploring the immediate area. It felt like the purpose of the trip in a way, more than the walk, just to be there and to properly absorb the way the oblique light sharpened the texture of every stone and dramatised colour. We relaxed into the place, confident the bothy would be ours alone on a Sunday. A clear, hard night was promised; a night which at this time of year would be equal in length to the day. We clinked across beach pebbles and admired the heaped lines of dulse ignited to a gingery glow by the lowering sun, luminous and wintry. Although there were signs of new grass emerging, a wild iris, trees were still bare and budless. Charlotte, who forages amongst the hills to flavour her seasonal chocolate fillings, noted that this time last year she was already able to pick sweet cicely, gorse flower, nettle and mint. What had happened to spring? As we awaited sunset, finding a new vantage point on a raised promontory between ‘our’ bay and its sister just to the north, two seals greeted us with raised noses, one hanging in the water either side of the pathway of sunlight laid towards us across the water from a low point between the Cuillin and Dun Caan. Having collected firewood and water we settled into the bothy with hors d’oeuvres of hummus and carrots, oatcakes and olives followed by a course of fresh pasta and tomato sauce. We paired Charlotte’s smoked sea-salt chocolate with cask-strength Aberlour. In layers of wool and down and with our hats still on and hot-water-bottles ready to fill, we shared a sense that life was good, and a bothy was an excellent and surprisingly comfortable place to be. We stared into the fire. But the copy of the Shelter Stone did not get burnt, at least, not yet. Conceived by artist Ed Summerton, the newsprint publication Shelter Stone brings together contributions by forty-six artists and writers all of whom have a fascination with mountain landscape. It includes photographs of site-specific work from Andy Goldsworthy and Hanna Tuulikki, poetry from Jen Hadfield and drawings from Sebastian Pöllmann. Although most contributions are contemporary, Aleister Crowley gets his own page. The deliberately small print run means that it will only be available for viewing in these particular remote locations; bothies, shelters and mountain huts across the UK, Iceland and the Alps, and all will be delivered between midsummer 2017 and 2018. The fire was central to the comfort and happiness of our evening. But it gave us a little uneasiness about our imprint on the place. An 1880 map of this area shows how much more extensive the oakwood once was. Its neat, circular shape encompassing the twin bays and butting up against the township, suggests that it may have been planted, perhaps for charcoal for local use. The surviving fragment is clearly now fragile, with no sign of young trees regenerating amongst the mature, and no protection for any new growth from grazing deer or sheep. Although we had gathered deadwood ourselves, there wasn’t very much of it, and for obvious reasons: the bothy book demonstrates the year-round popularity of this place and most visitors will do as we did. Signs in the bothy highlight both the ecological significance of our Atlantic Oakwoods as an element of the UK rainforest and the importance of not cutting live wood, as at any bothy. But there is no mention of why deadwood should be allowed to accumulate. These days all kinds of forestry manager have stopped ‘tidying up’ deadwood from woodlands but perhaps not many bothy-goers will know that it’s as vital to the health of a woodland ecosystem as is a living oak, with the multitude of species that depend upon it. Perhaps this presents a conundrum for estates with bothies and for the MBA, for education, or offering an alternative fuel? Later, we left the fire and took our whisky outside into air now stilled with frost, onto solidly-frozen ground, a dome of stars. The lighthouse flashed on the north-west tip of the Crowlins and beyond Raasay a long, diffuse beam arced high into the sky, shifting and splitting like gauze; then twisting on its axis. It could only have been an aurora and yet it was to our west and in no form that I have seen before. Later we learned that what we’d been looking at was a rare phenomenon called a ‘Steve’ (Strong Thermal Emission Velocity Enhancement) which aligns east to west and according to NASA, may extend for hundreds or even thousands of miles. It plays in the memory of this trip amongst the many forms of Uags-magic. 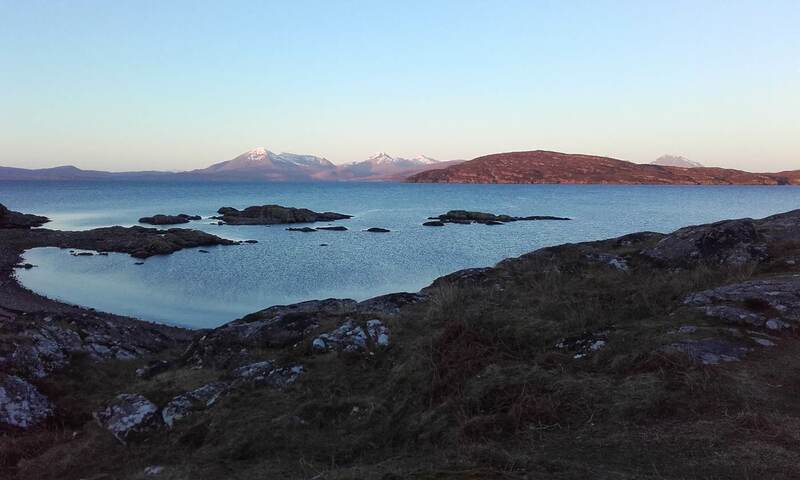 I slept, warmly, till the light woke me at 5.30 and soon we both went out to a frozen hush and a slight nag of wind, to witness pink light glowing on the Cuillin. A little later the sun rose over the back wall of our small, rocky amphitheatre and the birds were rising, the kettle on. A few boats and another submarine passed. The sea had calmed, and now we watched it turn from pale turquoise to cobalt under a completely clear sky as sat out in warm sunshine. (We didn’t, however, swim, as a visitor the morning before had claimed to do). When we came to walk out again, I was wearing two layers’ less wool than on the day before. 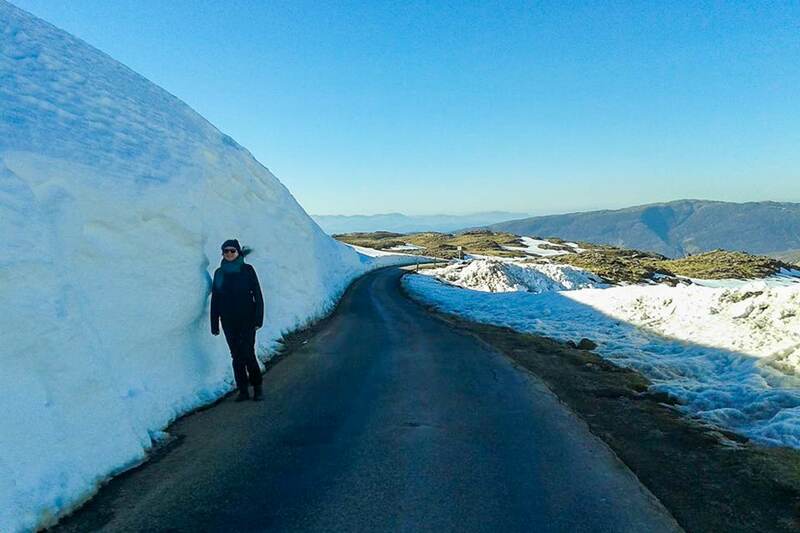 I’ve written before about the joys of a trip to mark the spring equinox, to see sunset and sunrise and stars, to feel the best of both extremes of the season in your bones – the passing freeze and the coming warmth. It gives me confidence in what awaits in Scotland in the warmer, lighter months; a reminder of how lucky we are to have such opportunities at our feet. By the time we reached the car, we felt we had walked into spring. A copy of the Shelter Stone has been duly delivered and this purpose gave a marvellous ballast to our trip to Uags. I like the thought of a future visitor pausing over some page or other that intrigues or entertains them, before scrunching it up for the fire. It may be the toughest paper round in the UK, but someone’s got to do it. The end-of-project exhibition of material from Shelter Stone – The Artist and the Mountain will be in the Royal Scottish Academy, The Mound, during the Edinburgh Festival. Opening Saturday 4th August.